I really enjoyed the first in David Baldacci’s Amos Decker series, so was looking forward to this one. Unfortunately, it wasn’t at the same level – a completely implausible plot, combining industrial espionage with an international spy ring, terrorism and family betrayal. Memory Man is the first book by David Baldacci to introduce Amos Decker. As a professional American footballer, Decker suffered a massive trauma to the head, changing his mental state forever – he now has hyperthymesia, he never forgets anything. Indeed, he can review any events from his life in full colour, even from before the injury. This, of course, is massively useful for someone whose job is analytical – Decker uses his new skills, becoming a gifted detective in the local police force. Scroll forwards, and Decker’s life is interrupted by another shocking event – his wife and young daughter are brutally murdered in his home (as well as the wife’s brother – this was glossed over in the book and the plot didn’t seem to require the additional murder). After that, his life goes quickly downhill – he loses his home and job, living out on the streets. Only belatedly, he finds the resolve to get some Private Investigator work to pay for temporary accommodation. So much for the back story. The plot for this book is that a serial killer is on the loose, massacring students and teachers at a high school and then proceeding to kill an FBI agent assigned to the case. The killer leaves personal messages to Decker, but ironically he cannot remember anything connected to this case that would help to identify the culprit. I gather there is going to be a series of thrillers featuring Amos Decker and he’s a much more complex and sympathetic character than, say, Agent John Puller in another of Baldacci’s series. If the others are as readable as this one, then they’ll be worth following. The premise of this book is that the brilliant Robert Puller has been convicted of treason against the USA and is being held in a maximum security military prison. His brother, the gifted investigator John Puller, still believes in him, even when he escapes during a storm. John Puller works with the intrepid Veronica Knox to investigate the escape and to clear his brother’s name. They focus on the witnesses who gave testimony against Robert Puller. If he is innocent, they can’t be, so the investigators have to uncover the truth behind their lies. This book made a good holiday read – if you have the impression that recent Baldacci books are a bit lightweight, this one won’t change your mind, but it is quite entertaining. 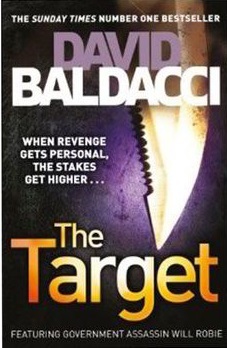 This is the first book by David Baldacci that I’ve read in a while. I enjoyed the early books in his King and Maxwell series, but thought they tailed off by the end. This book features CIA agents Will Robie and Jessica Reel, who have a tainted past with the agency, but are still at the top of their game. The real star of the book is a North Korean agent, Cha Chung, who has unmatched combat skills and an unshakeable character in the face of adversity. This is a decent read and I may track down the earlier books in the Robie series, particularly The Hit which comes before this one.